"Big stick" redirects here. For other uses, see Big stick (disambiguation). Big stick ideology, big stick diplomacy, or big stick policy refers to U.S. President Theodore Roosevelt’s foreign policy: "speak softly and carry a big stick, you will go far." Roosevelt described his style of foreign policy as "the exercise of intelligent forethought and of decisive action sufficiently far in advance of any likely crisis." The idea is negotiating peacefully but also having strength in case things go wrong. Simultaneously threatening with the "big stick", or the military, ties in heavily with the idea of Realpolitik, which implies a pursuit of political power that resembles Machiavellian ideals. It is comparable to gunboat diplomacy, as used in international politics by imperial powers. I have always been fond of the West African proverb: "Speak softly and carry a big stick; you will go far." published in the Brooklyn Daily Eagle on April 1, 1900, a reporter noted that "His motto, he says, he has taken from the South African people: 'Speak softly— carry a big stick— and you will go far.'" A good many of you are probably acquainted with the old proverb: "Speak softly and carry a big stick -- you will go far." Four days later, President William McKinley was shot by an assassin; his death a further eight days later elevated Roosevelt to the presidency. Roosevelt's attribution of the phrase to "a West African proverb" was seen at the time as evidence of Roosevelt's "prolific" reading habits, but the claim that it originated in West Africa has been disputed. No earlier citation for the phrase has been found, and there is no record of the phrase being used in West Africa before Roosevelt's time. It has been therefore suggested that he might have coined the phrase himself. Although used before his presidency, Roosevelt used military muscle several times throughout his two terms with a more subtle touch to complement his diplomatic policies and enforcing the Monroe Doctrine throughout multiple interventions in Latin America. This included the Great White Fleet, 16 battleships which peacefully circumnavigated the globe as an illustration of United States' rising yet neutral prestige under Roosevelt's direction. A map of Middle America, showing the places affected by the proverbial "big stick"
In the early 20th century, Venezuela was receiving messages from Britain and Germany about "Acts of violence against the liberty of British subjects and the massive capture of British vessels" who were from the UK and the acts of Venezuelan initiative to pay off long-standing debts. 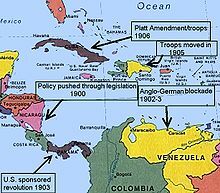 After British and German forces took naval action with a blockade on Venezuela (1902–1903), Roosevelt denounced the blockade. The blockade began the basis of the Roosevelt Corollary to the Monroe doctrine. Though he had mentioned the basis of his idea beforehand in private letters, he officially announced the corollary in 1904, stating that he only wanted the "other republics on this continent" to be "happy and prosperous". For that goal to be met, the corollary required that they "maintain order within their borders and behave with a just obligation toward outsiders". Most historians, such as one of Roosevelt's many biographers Howard K. Beale have summarized that the corollary was influenced by Roosevelt's personal beliefs as well as his connections to foreign bondholders. The U.S. public was very "tense" during the two-month blockade, and Roosevelt requested that Britain and Germany pull out their forces from the area. During the requests for the blockade's end, Roosevelt stationed naval forces in Cuba, to ensure "the respect of Monroe doctrine" and the compliance of the parties in question. The doctrine was never ratified by the senate or brought up for a vote to the American public. Roosevelt's declaration was the first of many presidential decrees in the twentieth century that were never ratified. The U.S. used the "big stick" during "Canal Diplomacy", the questionable diplomatic actions of the U.S. during the pursuit of a canal across Central America. Both Nicaragua and Panama featured canal related incidents of Big Stick Diplomacy. In 1901, Secretary of State John Hay pressed the Nicaraguan Government for approval of a canal. Nicaragua would receive $1.5 million in ratification, $100,000 annually, and the U.S. would "provide sovereignty, independence, and territorial integrity". Nicaragua then returned the contract draft with a change; they wished to receive, instead of an annual $100,000, $6 million in ratification. The U.S. accepted the deal, but after Congress approved the contract a problem of court jurisdiction came up. The U.S. did not have legal jurisdiction in the land of the future canal. An important note is that this problem was on the verge of correction, until Pro-Panama representatives posed problems for Nicaragua; the current leader (General José Santos Zelaya) did not cause problems, from the outlook of U.S. interests. In 1899, the Isthmian Canal Commission was set up to determine which site would be best for the canal (Nicaragua or Panama) and then to oversee construction of the canal. After Nicaragua was ruled out, Panama was the obvious choice. A few problems had arisen, however. With the U.S.' solidified interests in Panama (then a small portion of Colombia), both Colombia and the French company that was to provide the construction materials raised their prices. The U.S., refusing to pay the higher-than-expected fees, "engineered a revolution" in Colombia. On November 3, 1903, Panama (with the support of the United States Navy) revolted against Colombia. Panama became a new republic, receiving $10 million from the U.S. alone. Panama also gained an annual payment of $250,000, and guarantees of independence. The U.S. gained the rights to the canal strip "in perpetuity". Roosevelt later said that he "took the Canal, and let Congress debate". After Colombia lost Panama, they tried to appeal to the U.S. by the reconsidering of treaties and even naming Panama City the capital of Colombia. Cuba was not to make decisions impairing her independence or to permit a foreign power [e.g., Germany] to secure lodgment in control over the island. Cuba pledged herself not to incur an indebtedness beyond her means [It might result in foreign intervention]. The United States was at liberty to intervene for the purpose of preserving order and maintaining Cuban independence. Cuba would agree to an American-sponsored sanitation program [Aimed largely at yellow fever]. Cuba would agree to sell or lease to the United States sites for naval or coaling stations [Guantánamo became the principal base]. Just at the moment I am so angry with that infernal little Cuban republic that I would like to wipe its people off the face of the earth. All that we wanted from them was that they would behave themselves and be prosperous and happy so that we would not have to interfere. At the conclusion of the Russo-Japanese War in September 1905, President Roosevelt leveraged his position as a strong but impartial leader in order to negotiate a peace treaty between the two nations. "Speaking softly" earned the President enough prestige to even merit a Nobel Peace Prize the following year for his efforts. ^ "Roosevelt's "Big Stick" Foreign Policy | US History II (OS Collection)". courses.lumenlearning.com. Retrieved 2018-12-21. ^ "Big Stick and Dollar Diplomacy". High Beam Encyclopedia. 2001. Retrieved 2008-07-16. ^ "Speak Softly. ." Retrieved 2016-03-24. ^ Roosevelt, Theodore (1902). The Strenuous Life: Essays and Addresses. New York: Century. p. 288. ^ "Speak Softly. ." Library of Congress Exhibit. Library of Congress. 2007-10-31. Archived from the original on 10 July 2008. Retrieved 2008-07-14. ^ a b Martin, Gary. "Speak Softly And Carry a Big Stick". ^ "Theodore Roosevelt: Foreign Policy". Encarta. MSN. 2008. Archived from the original on 2009-10-31. Retrieved 2008-07-24. ^ Fagan, Patrick (2005-05-18). "On Historians' Changing Perceptions of Theodore Roosevelt Pre-1950s and Post-1940s". WorkingPapers.org. Retrieved 2008-08-27. ^ Burns, James MacGregor; Dunn, Susan (2001). The Three Roosevelts (1st ed.). Atlantic Monthly Press. pp. 76–77. ISBN 0871137801. ^ "The Panama Canal: History". eclipse.co.uk. 1999-12-30. Retrieved 2008-08-20. ^ Vargas, Diego Uribe (2007-01-12). "CAPITULO XIV: Memorial de Agravios" (in Spanish). Biblioteca Luis Ángel Arango. Retrieved 2008-08-21.